If you're looking for a professional-level instrument, this is a decent offering for a reasonable price. Good tone for plucking and bowing alike. The recent resurgence of 50s-style music, led most notably by the likes of Brian Setzer and Imelda May, has seen the double bass become an increasingly common sight and sound in contemporary music. If you're unsure of just how it sounds, check out either L'éléphantfrom Saint-Saëns' Carnival Of The Animals or, perhaps more familiar still, the theme to Steven Spielberg's Jaws. 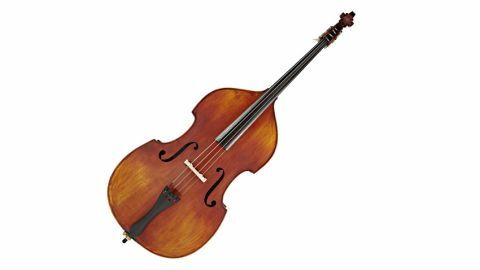 The classification of this bass is somewhat confusing as the term '3/4-size' is used to describe what is the most commonly-used size of instrument. It measures 182cm from the tip of the scroll to the bottom of the body, while the largest bass size, the virtually redundant 7/8, actually possesses its own gravitational pull. With an extendable spike to help it stay reasonably stable when held upright, it's a cumbersome beast indeed. Included in the price is a humungous padded case, which should protect the bass from knocks, and even has wheels mounted into its base to make transportation easier. That said, it's unlikely to fit into a family hatchback and the tribulations involved in moving a double bass from gig to gig is baked right into the experience. The construction is also traditional. The top is fashioned from Canadian spruce, with a body and ribs of lightly flamed Canadian maple. All surfaces save the rear of the maple neck and the maple bridge itself have been hand-stained in orange-brown. Bass fingerboards are usually made from ebony, and here the spec merely states that 'hardwood' has been used. Be that as it may, the playing surface is suitably smooth, which, sadly, is more than can be said for the somewhat untidy finishing elsewhere. Unlike other orchestral string instruments, the double bass is tuned in fourths and, even better for guitarists, runs E, A, D, G, from low to high, at the same pitch as a standard bass guitar. It's important to ensure that the bass is tuned to the correct pitch in order to allow its full range to be heard. A set of bass strings can range from £20 to over £200 and the Archer is strung with flatwound steel wires. You can also opt for old-school gut strings, which do sound better for slap techniques, but tend to break more easily. There's also a bow of the German style included and, last but not least, a block of overly hard rosin to aid the horsehair in gripping the strings. The tone of the bass is pleasantly surprising in the various styles we tried out on it. You tend to feel the sound as much as hear it, and the plucked tone is warm and well balanced. For beginners the action may be a little high, but the adjustable maple bridge and even a little sandpaper applied to the underside of its feet will allow you to set it to your exact tastes. The instrument is equally convincing when bowed, with just the right mix of rasp from the bow and depth from the spruce. All in all, we're impressed. We'll let you into a little secret: if you can get yourself to a decent standard playing the double bass, you should be able to make a nice stack of cash as bands are crying out for players. This isn't the cheapest bass we've found, but neither is it the most expensive - a pro-level classical bass can set you back five figures. If you're serious about playing, yet don't want to break the bank, this is a serious option.